A creamy tomato soup made with home-canned tomatoes, pesto, and roasted garlic. 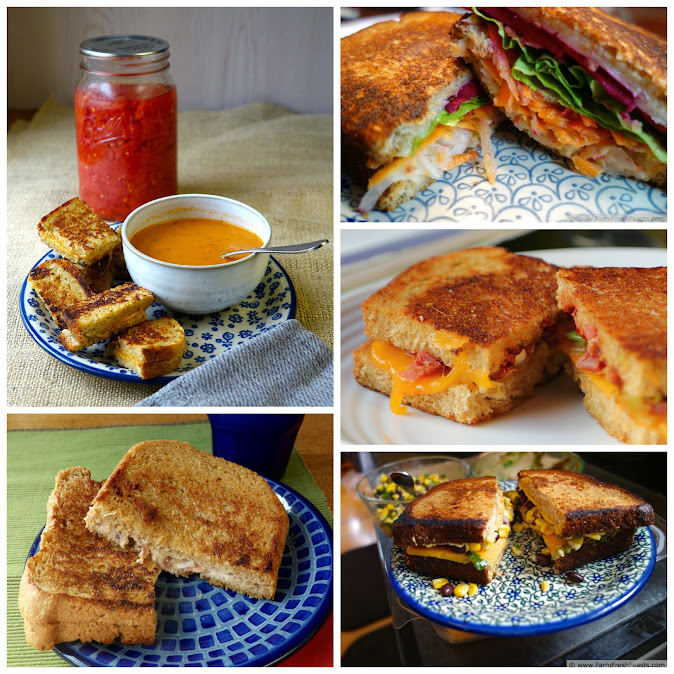 Grilled Cheese Sandwich month (season? day? week?) 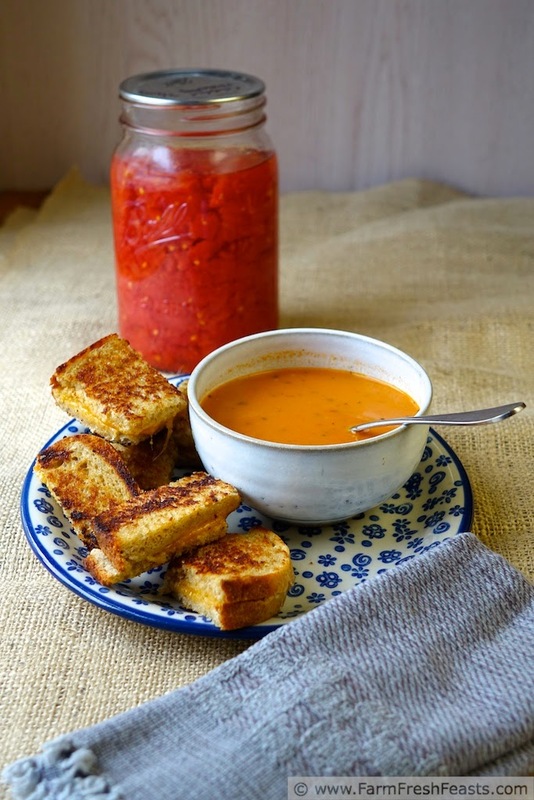 is coming, and before I share my fig-filled, or my tomato jam-spread, or my guacamole & corn grilled cheese creations I'd like to share the perfect accessory for all good grilled cheese sandwich meals--tomato soup. Putting up tomatoes is a terrific way to step into the Big Scary World of Canning. With a tall pot, a bunch of quart-sized canning jars--I would borrow from a friend a funnel and a pair of tongs jar lifter your first time--you can have the building blocks for a variety of meals. If you don't grow your own tomatoes you've got plenty of options for amassing a canning quantity. 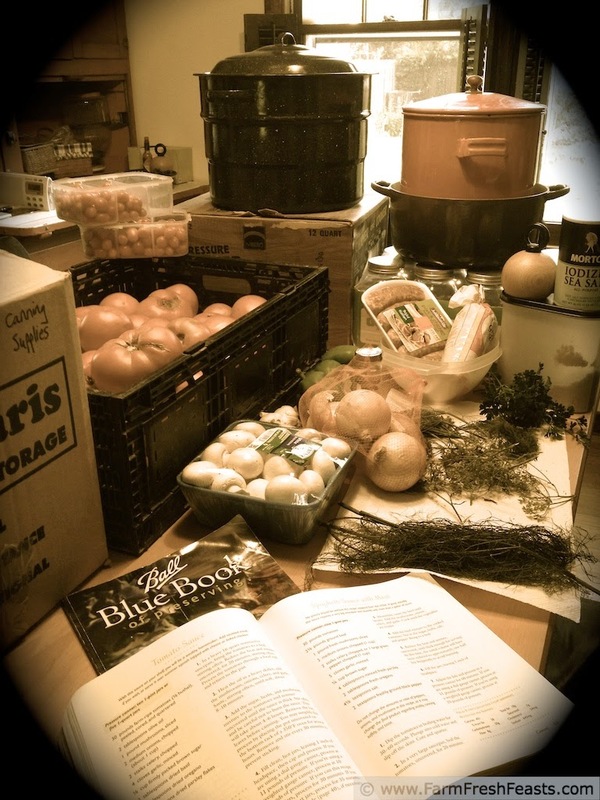 You do NOT need all of these supplies to can a few quarts of crushed tomatoes! If you've got neighbors who are overrun with ripe tomatoes, especially neighbors who are older than you, offer to put up the whole mess and share the preserved bounty with the gardener. 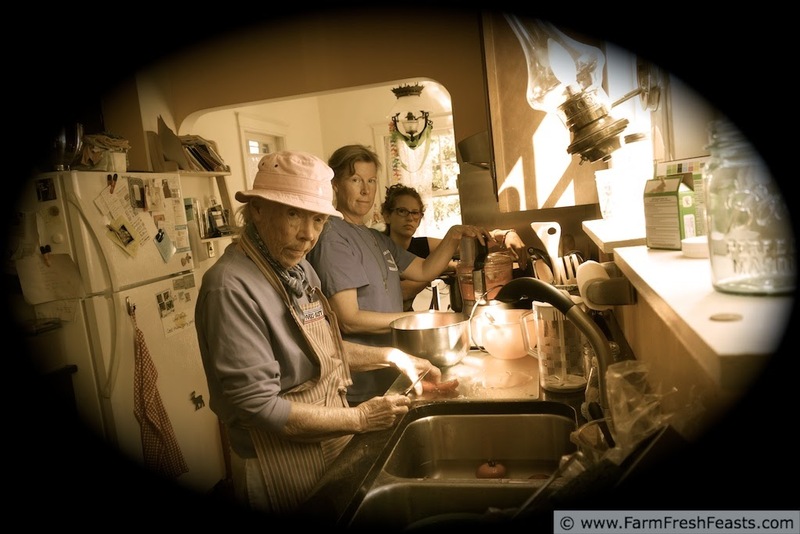 Ask your Community Supported Agriculture (CSA) farmer to sell you extras. Your farmers will be delighted to have ripe tomatoes go quickly and easily to a good home. If you don't participate in a CSA but do frequent the farmer's market, tell a farmer that you're interested in "seconds" or "canning tomatoes", and when tomatoes are abundant you'll be doing each other a favor buying ripe and ready, perhaps slightly cosmetically damaged, tomatoes for a good price. When I put up crushed tomatoes I follow the basic method--shared on the Pick Your Own website, on the National Center for Home Food Preservation website, on the Food In Jars blog, and in the Ball Complete Book of Home Preserving (Amazon affiliate link) that I checked out of my local library a bunch of times before buying my own copy. Gratuitiously long caption as I don't know how to make words appear when you hover over the photo (though I do know how to link parts of a collage to other posts): All you need to can is a tall pot with some sort of shelf to keep the jars off the bottom; and jars, and water--lots of water; and a heat source to heat that water (and heat the tomatoes, too); tomatoes, lemon juice and salt and a sharp knife to cut the tomatoes plus a bucket to store the peels before they go to the compost, and a flat surface for them to cool, and a pantry to store your bounty. And the floating tomatoes? I screwed up and let them get cool in between packing and processing. No problem, still good eating. Canning crushed tomatoes is safe and easy if you follow the directions. Just peel the tomatoes, squish the tomatoes, pack the squished tomatoes into clean jars with salt and lemon juice, and stick 'em under boiling water according to the methods I've linked to above. For other recipes using tomatoes, canned or otherwise, please see my Red & Yellow Tomato Recipes Collection or my Green Tomato Recipes Collection, part of the Visual Recipe Index by Ingredient, a resource for folks like me eating from the farm share, the farmer's market, the garden, the neighbor's garden, and great deals on ugly produce at the grocery store. In a large pot (at least 3.5 quart) over medium heat, melt the butter. Add onion and sauté for 5 to 8 minutes until softened. Sprinkle flour over top, stir to coat with butter, and cook an additional 3 to 5 minutes until lightly browned. Stir in tomatoes, stock, pesto, tomato paste, garlic, parmesan rind and seasonings. Bring to a gentle boil, then reduce heat and simmer for 30 minutes up to 2 hours. Before serving remove the parmesan rind and stir in the evaporated milk. Use an immersion blender (or puree in batches) if you like a smooth soup. 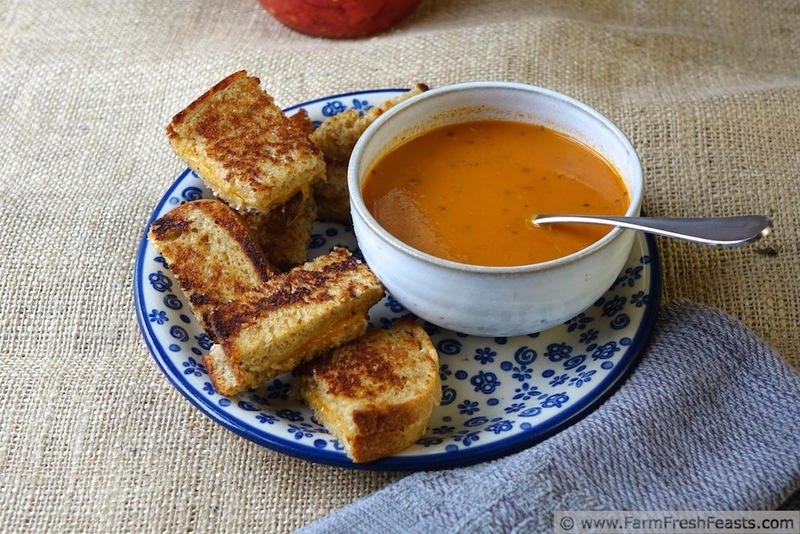 This looks like the best tomato soup ever! I have to admit that I'm afraid of canning. I may give it a try this summer because every winter I'm dying for some delicious, ripe tomatoes and berries. Thanks for the inspiration! I'd hoped, in posting this recipe now, to gently nudge the concept of canning into as many brains as possible before tomatoes are super abundant. [Hey, I wonder if any Aussies are canning right now?] Tomatoes are really easy to can, and the pay off is so great. In fact, I'm going to try to emulate the sauce from a Lou Malnati's classic pizza with a jar pretty soon (just came back from a trip to Chicago for Spring break). 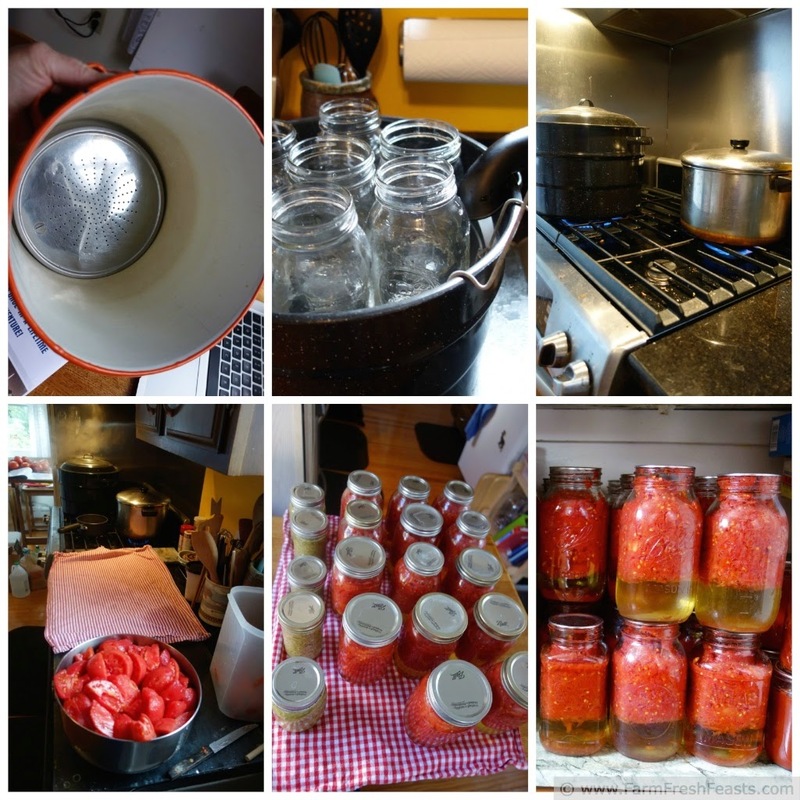 Canning tomatoes is such a great group activity. It's a lot of repetitive work, which lends itself to hours of chit-chat and laughter. You're exactly right! I consider myself fortunate to have my folks able to come and can (actually, in that photo they'd come to watch the kids while I walked a half marathon, and during their stay we canned. And canned.) Each visit we make different foods, and the stories that come out are always interesting. Thanks! PS I am in awe - you can your own tomatoes! Your soup looks amazing! I don't think I could get up the gumption to can tomatoes myself! Aww, thanks! 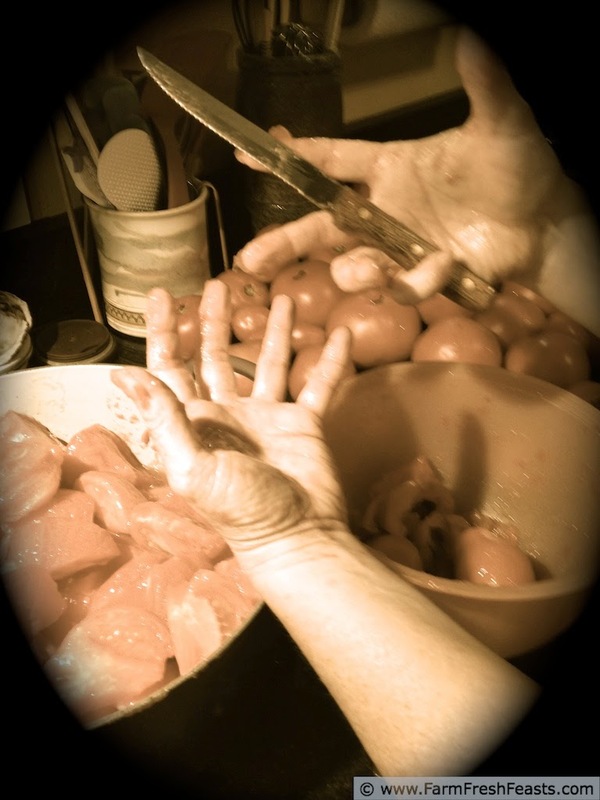 I'm telling you, canning tomatoes may take gumption to decide to do it, but once you start the process it is very easy. Me, grilling is something I am shy about doing. I won a pizza grill kit, so I'll be overcoming my fears this summer. My fear of homemade pie crust? Yeah . . . not getting over that one any time soon. Kirsten, just love your site, and have used quite a few recipes and tips. Ever since I can remember, my Grandma Gantt CANNED EVERYTHING that could possibly be canned. A few years after purchasing my Ball jars, their book and the utensils, I finally got enough guts to can some of the lovely tomatoes that my husband grows each year. It was really easy, and I believe that this summer, I'll have enough about me to branch out and can some peaches (panicked when the 'book' mentioned pressure cooker). I will look up Ina's recipe. I feel really silly that I'm scared of pie crust (pie crust!) when yeast is no big thing, and want to branch out and try my wings more in the kitchen this year. To make a pasty with homemade crust--wow, that would be cool. I was at a Hot Soups for a Cool Cause event the other week (where I got that lovely white bowl), and the one of the soups was a Creamy Tomato Pesto Bisque served in shooter cups with a grilled cheese "crouton" on top. Genius! I saw my pesto when I was rooting around in the freezer for the roasted garlic, so I decided to give it a go. It was yummy. Your brainwashing is working. My curiosity is piqued and I am definitely intrigued. They actually sell big batches of canning tomatoes through the CSA, and I've always held back because I'm not actually canning anything. Maybe this will be my year. Under your tutelage that is. Good stuff; I thank you. I've got a spare Foley food mill if you are ready to take the plunge. A larger one came into the thrift shop and I couldn't resist. This is a wonderful looking soup! Thank you so much! I was pretty pleased with how these photos turned out--and even more pleased with the flavor of this soup. 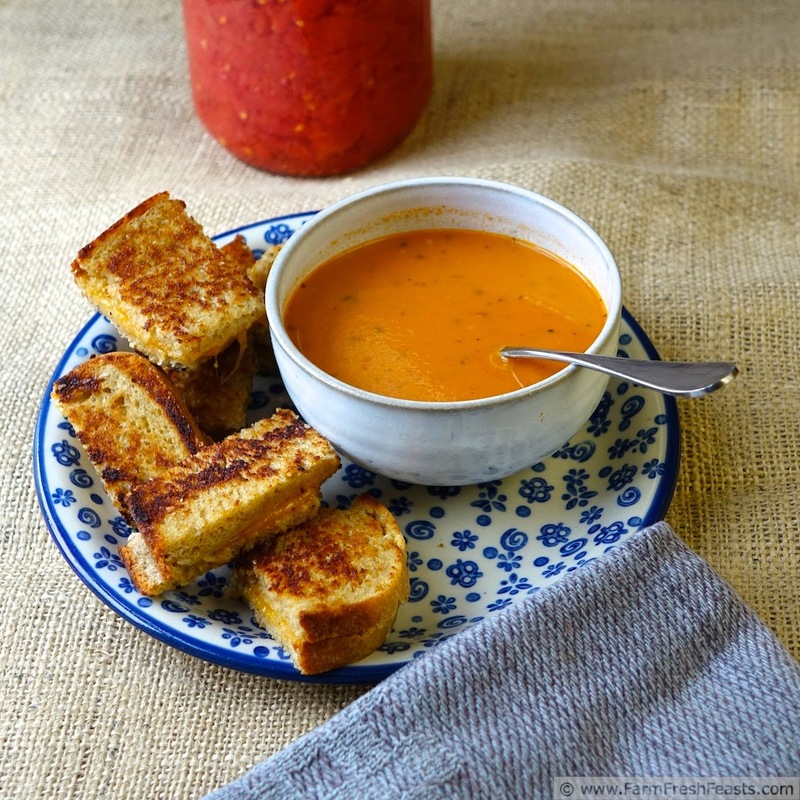 I bet the taste of tomato soup with cheese and croutons is very close to the taste of tomato soup with grilled cheese sandwiches. A terrific combination. What a great looking soup! I've always been reluctant to can tomatoes, due to all the work involved with the peeling, LOL. Thanks for sharing at Simple Supper Tuesday. My daughter and I usually set up an assembly line to can tomatoes--she'd blanch, I'd peel and crush, then we'd pack into jars and can. Then I discovered this Foley food mill gadget at my thrift shop, and yowza--chop up a tomato, toss it into the mill, have your kids turn the crank, and out comes tomato puree. It's that easy! We fed the composting guinea pigs the remaining peels/seeds from the mill, so everyone is happy. This summer I'll do a combination of crushed tomatoes and sauce, and both would work in this recipe. Many hands do make light work! Thanks! I am envious of your pressure canner! I borrowed one once from a friend, and even though her mom had carefully packed the instruction book in the box I was still scared that the house was going to blow up. I would like to can, not freeze, my stock so I could make spur of the moment soups. My spouse is from the UP (eh!) and told me that our winter in Northern Japan was similar. I remember being blown away at the running snow total on the base TV channel. We got over 12 feet that year. Thanks for taking the time to let me know you enjoy the recipe--I appreciate it! I was just looking for a recipe to use some of my lovely canned tomatoes from last summer, and BOOM, this is it! I'm home, with a cold,too much snow, and no pesto, but I do have fresh basil so I'm going to improvise. Can't wait to taste this soup. This soup is a terrific choice when you're home with a cold and too much snow! I have made it several times this winter (to the point that I'm getting choosy about using my tomatoes--I'm starting to see the back of the pantry) and it always satisfies us. I am sure your improv will be great. Thank you for the post, I will be using this recipe a lot during the winter months, Luv's from Iowa!